During this two-part workshop you’ll be knitting a top-down yoke swatch in the round. You’ll practice two-color stranded knitting and learn how to choose colors for successful yokes. We’ll cover techniques for knitting smooth and crisp colorwork, learn about different yoke construction styles, go over short row and body shaping options, and learn how to follow a top-down yoke chart while you shape your yoke swatches using a fun invisible increase. 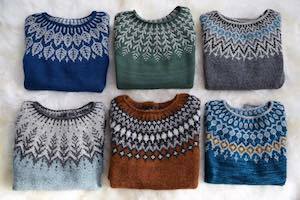 Jenn will bring a lot of her yoke sweaters for you to check out and we’ll go over any specific questions you might have.